A group of Shilluk youths standing next to a hut, one holding a spear and another youth with a fishing net (seen in another image). A tall member of the group has turned to walk away. 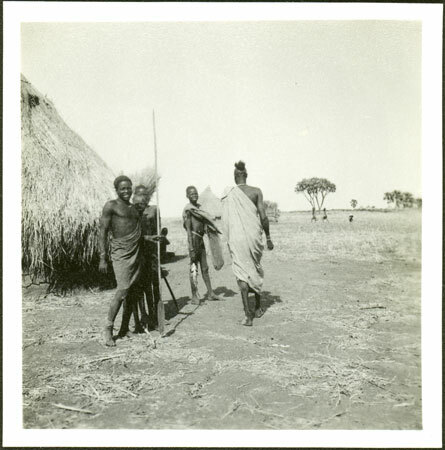 It seems that Evans-Pritchard visited a Shilluk village briefly during one of his trips to the Nuer, probably the Doleib Hill missionary station on the Sobat River (roughly six miles from its confluence with the White Nile), established in 1902 by the American Presbytarian Mission and after 1925 run by Rev. J. A. Heasty, seen in one of the images. PRM Accession Records - Accession Book Entry [p. 98] 1966.27 [1 - 24] G[ift] PROFESSOR E. E. EVANS-PRITCHARD; INST. OF SOCIAL ANTHROPOLOGY, 51 BANBURY RD. OXFORD - 1966.27.19 - S. SUDAN, DARFUNG. VARIOUS TRIBES. Box of negatives in envelopes, [1 - 242] & 1966.27.20 - Box of prints of these negatives [refers to object 1966.27.19] [1 - 242], in envelopes. Note on print reverse ms pencil - "9 101 Shilluk"
Morton, Chris. "Portrait of Shilluk youths " Southern Sudan Project (in development). 03 Jan. 2006. Pitt Rivers Museum. <http://southernsudan.prm.ox.ac.uk/details/1998.348.11.2/>.